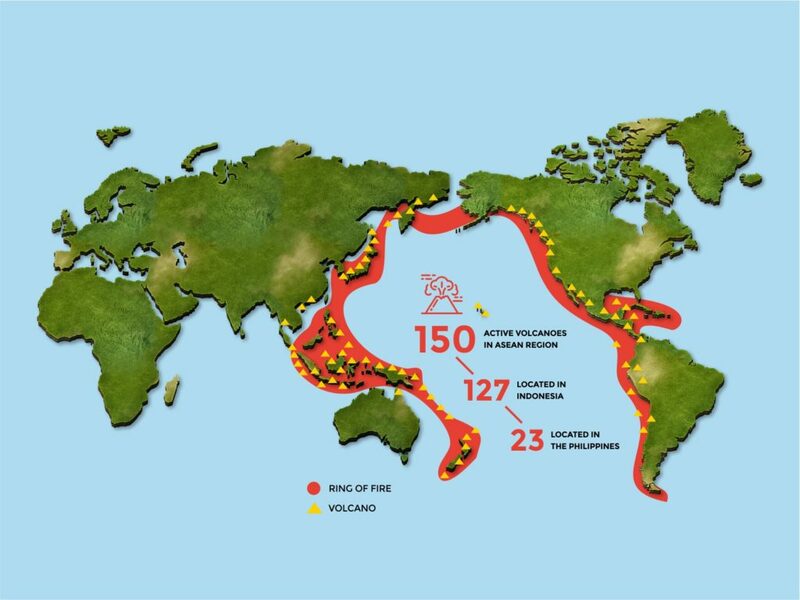 Situated on the Ring of Fire, the ASEAN region faces one of the greatest threats of natural disaster due to geophysical activity along this unstable belt of tectonic plates. One of the key disaster threats categorised into the geophysical type are volcanoes, as well as a range of related disasters that can occur as the result of volcanic activity. During 2018 ASEAN has experienced a range of geophysical events that have triggered disasters. Therefore, understanding the varieties and impacts of such occurrences is highly important for disaster management across the region. 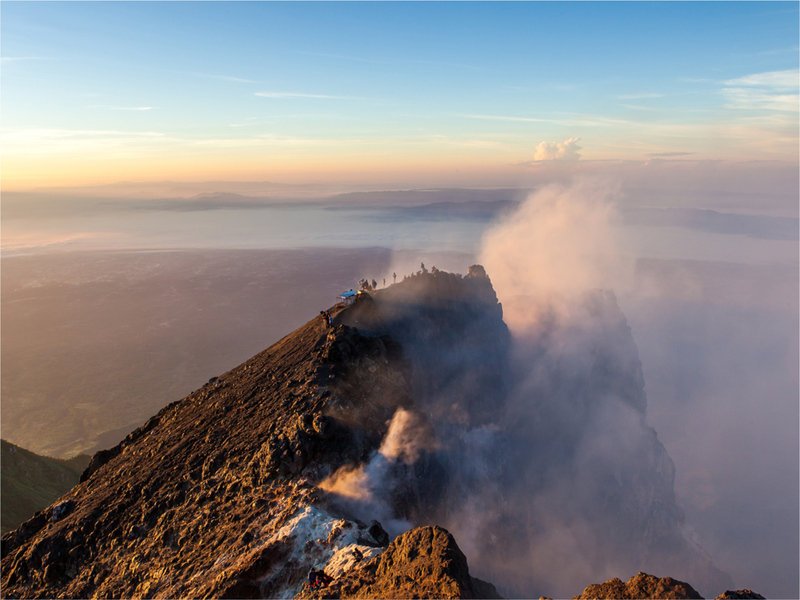 The AHA Centre closely monitors the ongoing dynamic conditions of 150 volcanoes in the ASEAN region that are active and have a recent historical record of eruptions.127 of these volcanoes are located in Indonesia, with 23 in the Philippines, while volcanoes found in other areas of the region are currently dormant. Volcanoes in other ASEAN countries are in dormant condition, such as those in Viet Nam with its last eruptions dated back in the early Holocene era or underwater volcanoes in Andaman Sea between Thailand and Myanmar. Most recently in late 2017 to early 2018, monitoring, preparedness, and pre-emptive evacuations were undertaken by respective local and national agencies due to increased activities on Mount Agung (Bali, Indonesia) and Mount Mayon (Albay, the Philippines). However no lives were lost due to this increased activity. As of September 2018, only Mount Sinabung (North Sumatra, Indonesia) remains at Alert Level IV (out of the maximum 4 alert levels) – which means it may experience major eruptions at any point – with the level IV status ongoing throughout the past five years. Mount Agung remains at Alert Level III, while all other volcanoes in Indonesia and the Philippines are currently at Alert Level II (localised activity with no serious eruption risk). A volcano is an opening in the Earth’s crust that allows molten rock, gases and debris to escape to the surface, often exploding through the surface with severe strength and impact on nearby geography. Volcano eruptions are categorised into geophysical hazards that occur when magma (molten rock) is released from a volcanic vent, with eruptions classified into a range of different types including phreatic, phreatomagmatic, surtseyan and effusive (lava-bearing) eruptions. Most hazards, phenomena and disasters associated with volcanic eruptions affect areas close to the volcano itself. Of high importance is the realisation that volcanic activity may also trigger other natural disaster events, including tsunamis, landscape deformation, floods, and tremor-provoked landslides. Earthquakes and volcanoes are intrinsically linked, as they result from tectonic plate processes that constantly reshape the earth’s surface. Earthquakes form a key clue that a volcano is preparing to erupt, as the movement of magma exerts significant force on the earth above it as pushes through the crust. This pressure from the rising magma causes many of the earthquakes that occur in volcanically active areas. However, such earthquakes also rarely exceed magnitude 5, and are barely noticeable outside the vicinity of the volcano itself. Such earthquakes do help volcanologists to map and track underground lava flows, with different types of earthquakes often resulting based the signature of tremors, then used to determine if the volcano is heading towards an eruption. Seismic information such as this is valuable for volcanologists who are monitoring eruption events such as explosions or lahars.